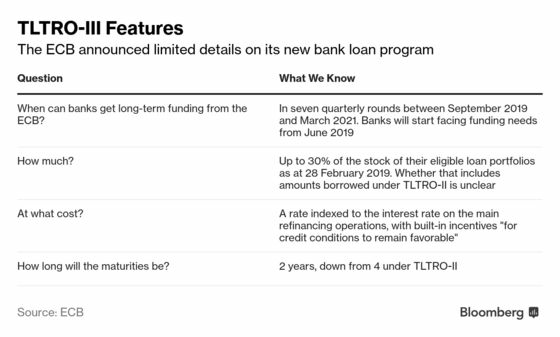 (Bloomberg) -- The exact modalities of the European Central Bank’s new long-term loan program will depend on the outlook for lending, according to the institution’s chief economist. Earlier this month, officials announced that a third round of targeted longer-term loans will be extended to banks starting in September. Financial institutions that exceed lending targets could face more favorable interest rates, with ECB staff currently studying various incentive options. Banks in the euro area have slowed lending in recent months as companies reined in investments amid uncertain business prospects. The ECB has said its so-called TLTRO-3 program will help to increase the economy’s resilience to shocks.